Corrugated Paper (single-faced corrugated paper in rolls) is the perfect solution for people who are shipping furniture, glass products and a host of other items. The corrugated cardboard will protect items from chips and scratches whilst in transit. Flexibility and versatility is the name of the game with corrugated paper - it can be used to protect any shape or sized item as it can be wrapped and manipulated to fit around awkward shapes such as chair and table legs along with other furniture. The shock-absorbent raised fluting gives items an extra level of cushioning and can be combined with quality bubble wrap & protective foam on a roll. 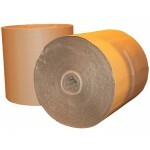 For maximum protection wrap using multiple layers. In addition to furniture it's Ideal for books, CD's and DVD's. Smaller products wrapped in corrugated paper can easily be stapled creating a sturdy and robust package. A fantastic packaging solution for eBayers, busy mail rooms, mail order companies.